! The template is AS9100 Rev C and ISO 9001:2008 compliant. Our Quality Systems Manual template is fully compliant with ISO, AS9100. It is a real template - not just sample document. It is specifically designed by our experts to be quickly and easily customized by you to meet your own company's circumstances. You will find that our manual template can be fully edited by you in any MS Word version. Our template is very user friendly which allows you to make any changes in order to suit your specific business model needs. This is a fully functional Quality Manual template that is ready to be audited and only needs your company name and logo. And, when you have questions, our experts are only an email away. easy to customize in Microsoft Word software (version 1997 and newer) - no special software required! complete, fully AS9100 Rev C and ISO 9001:2008 compliant and approved. our template is more than just a sample. Easily customize our template and you'll instantly have your entire and complete AS9100 manual - tailored to your individual company. 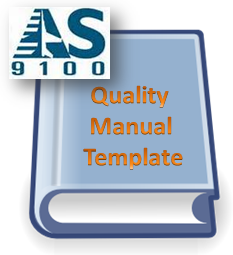 our template gives you an ideal starting point and jumpstart for your AS9100 implementation. with materials that are proven successful you don’t have to make the same mistakes that others have already made. if you use a good quality manual template, you can actually get a simple and user-friendly AS9100 quality management system that significantly improves your business operations and efficiency. with good template, you can reach AS9100 certification quickly, easily and - very important - inexpensively.